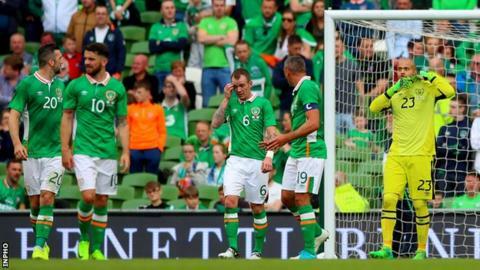 Republic of Ireland boss Martin O'Neill has refused to say whether Darren Randolph's place is under threat for the World Cup qualifier with Austria. West Ham keeper Randolph's glaring mistake gifted Uruguay their first-half goal in the Republic's 3-1 friendly win at the Aviva Stadium on Sunday. Sheffield Wednesday keeper Keiren Westwood then came on at half-time. "I'm not going to be part of your debate," said O'Neill of the keeper issue for Sunday's qualifier in Dublin. "I have some choices to make during the course of the build-up to the game and that is good for the Republic of Ireland. "We didn't want people stepping into the side and thinking that they own it for the next couple of years." Randolph has been the Republic's first-choice keeper since coming on to replace injured Shay Given in the Euro 2016 qualifier win over world champions Germany in October 2015. The West Ham keeper has rarely let the Irish down since but Westwood's consistent form for Wednesday means he now appears to be pressurising Randolph for the keeper's jersey. O'Neill will have 27 players to choose from for Sunday's vital qualifier after David McGoldrick was ruled out with a knee injury. The Ipswich Town striker sat out training earlier and scans later confirmed that he won't recover in time to play this weekend. Austria will be without their influential Stoke midfielder Marko Arnautovic, who is suspended, while Red Bull Salzburg's Andreas Ulmer is unavailable because he is getting married this weekend. Despite the duo's absence, O'Neill is expecting Austria to be fired up as they attempt to avenge their 1-0 defeat by the Republic in Vienna last November. "They have probably dropped a couple of points that they maybe didn't expect - maybe all three against us, which was not on the agenda. "They were strong favourites that night and that was only a few months ago, so they might be disappointed with their haul of points at the moment. "I still think they are a top-quality nation." O'Neill side's are level on points with Group C leaders Serbia, with both Wales and Austria four points off the pace at the halfway point in the campaign.